This past week I sat down with Northeastern Wisconsin smallmouth guide Nate Sipple to talk about the challenges of presenting to feeding fish in the skinny, clear water of late summer. His advice? Think less about color, less about profiles, and more about sound. MC: What’s your first consideration when you’re starting a late-summer, skinny-water day on the river? NS: My first consideration is the fly we’ll start out with, and that depends on where the fish are. Every day is different, even with stable temperatures and barometer. Someday I’m backing my boat off the trailer and I’ll see three of four fish waking in the shallow feeding flats. On that kind of day I know I need to throw a popper or terrestrial, something with a subtle sploosh to get their attention but not so aggressive that it drives them off the flat. In those situations I’m definitely thinking less about profile and color than sound on the water. That’s because with skinny water it’s unlikely the fish are going to be able to get a good look at your fly from directly underneath. So I’m thinking about sound, and I’m thinking about it in two ways: the sound it makes when it hits the water and the sound it makes when I manipulate the fly—if I manipulate it. In low water, that’s a big if. As far as color goes, yellow and chartreuse are fantastic. Blue can be good if damselflies are coming off. Black can be good late in the day or on a really hazy, humid day. Orange is a bit of a wild card. Either it’s hot as a pistol and you can’t keep fish off of it, or you’ll put it on the water and fish will be waking away from it as fast as they can. MC: Where does that fear come from? NS: In saltwater, death can come from all around a fish. But in freshwater, they are wary about what’s right above them—an eagle or an otter. So they are responding to that sound, that vibration, from above. That’s especially important in smallmouth rivers, which tend to be rocky—a rocky bottom amplifies the sound that flies make upon splatting down. In the name of subtlety of sound, we’ve fallen in love with a family of flies we call wigglies. They were brought up by a good friend and Florida guide named Jack Allen. When he first came up, he had these boxes of tiny foam spiders that he cast on a four weight. We are all 7- and 8-weight guys up here, and thought we were in for a long week. But we saw some incredible eats—even on windy days when flags stood out straight and there were standing waves everywhere on the river. Dave Whitlock helped refine that pattern into something called the Nuevo Spidaire. It’s basically a fancy-looking bluegill spider. But it lands quietly, and those little legs move around in the slightest current. In fishing the Spidaire or any other soft-sounding fly, your casts need to be soft. We stop our rod tips early, really let that line and leader straighten out and then slowly drop down to the water. The fish are out on those shallow flats for a reason—to feed—but they are skittish. MC: Is there any difference in how you’d target bigger fish? A different presentation or fly? NS: The big difference isn’t really in what these fish eat but how they eat it. The big, big fish have a kind of cockiness. They come up, there’s no hesitation, they do their thing and go back down with it. And it’s subtle. You would have guessed there was a scuba diver down there with a pair of hemostats that just reached out and pulled the fly under at the hood bend. Hardly even a ring. And my customers will set the hook and the first thing out of their mouth is, “Oh, it’s just a little fish.” They’re in for a rude—a pleasantly rude—awakening. On the other end of the spectrum, the little ones will get sloppy. They’ll eat like a largemouth from time to time. They’ll hit it, smash it out of the water, jump right away. I love to watch the way people react to those eats. They’ll see the splash and think: big fish. Then they’ll set the hook and see that it’s twelve inches. MC: Where does the low water of summer cause the greatest problems? NS: Definitely on the feeding flats we’ve been talking about. Oftentimes they’re in water that barely covers their backs. Wading makes you more vulnerable to being outted, since you’re likely going to be pushing some wake. You definitely need to plan your attack if you’re wading, and of course watch your shadow. For these situations we often step down with our rod weights and perhaps go down to 8 pound test. As for manipulation of the fly, there’s really an art to it. If we’ve got a fish inspecting our pattern, a twitch is going to send them bolting. We tell our clients to do enough to “move the legs” but not twitch the fly. It’s something you need to get a feel for. That said, there are advantages to low-water fishing, too. One of them is that in low water the fish are visible. Not that you are going to necessarily see the full fish. But they’ll give themselves up in the form of nervous water, wakes, subtle movements on the water. So before you start fishing, take a cue from the trout angler’s playbook and take some time out to just sit there and observe. MC: Last bit of parting advice for the low-water angler? NS: Use your casts wisely. 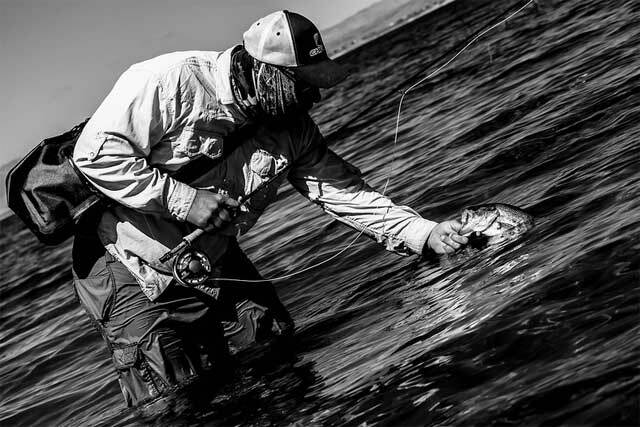 Casting to low-water flats fish is like working with a genie—you only get so many wishes. And you can’t wish for more. Start short and work your way out. I have customers that really like to bomb it out to the back of the flat. And it’s often a fish that makes them do this: they are trying for that obvious waker tucked away at the back. But the reality of it is, they’ll cast and I’ll see seven wakes blowing off of that water and heading for the depths. 95 percent of the time, those fish are not going to come back. And the 5 that return are no longer in that feeding mode—they are in stay alive mode.